I’m almost certain this is a one-of-a-kind app. It has to be. Holograms, recently released on the iPhone and iPod touch, allows you to create virtual holograms in a flash. While you can’t have true Push Gmail on the iPhone [Editors Note: You can, if you set up Gmail as an Exchange account, but you don’t get Push Notifications this way], an app arriving very soon on the App Store will come close to replicating the true experience. Currently, the iPhone’s Mail App pings Gmail periodically, or when you hit refresh, to see if you have any new messages. Push e-mail would be virtually instantaneous - as push notification on the phone is. GPush is an app that will shoot off push notifications whenever you get new e-mail. You’ll then be able to go into your phone’s Mail App and see your new e-mail as the Inbox refreshes. 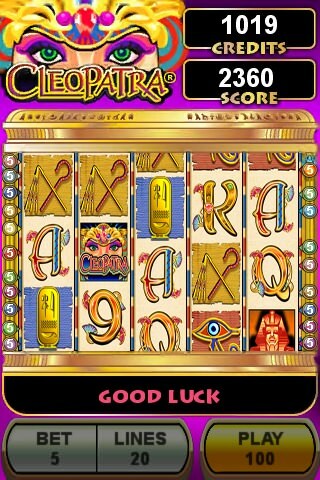 Cleopatra is the perfect iPhone and iPod touch game for the first type of slots player. And possibly a fun diversion for the other two types of players. IGT, International Game Technology - a slot machine manufacturer, recently released Cleopatra on the iPhone and iPod touch. The app is a portable version of the video slot game that’s in casinos all over the world. The iPhone and iPod touch version is a solid rendition and should be up your alley if you’re looking for a slots game. We’ve got a couple of NYC MTA-related subway apps we want to share with you today, the first being Exit Strategy NYC. A simple app, Exit Strategy NYC basically shows you which car you should ride in depending on where you plan on getting off the train. You tell it what line you are riding, and which direction you are going, along with telling it your final destination. It will then show you which train cars are closes to the exits and staircases for transferring. We do know that a majority of the lines and stops in all of New York City are covered, but there are a few that aren’t complete. Still, those will come in a future update, and this app can really end up saving you a ton of time. Even better, it’s only $1.99, which means it costs less than a ride on the subway. This one is highly recommended, and you can purchase Exit Strategy NYC now in the App Store. 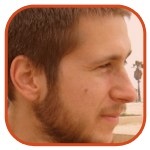 Sometimes, it’s the simplest apps that turn out to be the best, and SmackTalk! for the iPhone proves that point. You see, all SmackTalk does it record your voice, and play it back to you at a faster speed. However, they also have animals whose heads move when it plays back your voice, so it appears that a hamster (or cat, or dog, etc.) 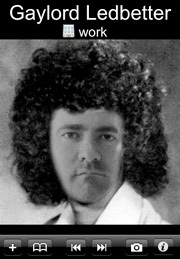 is repeating back to you what you said. Kids love this, as I have witnessed first-hand. 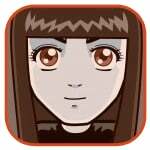 Check out the video above for a demo, and you’ll be wanting to grab SmackTalk for $1.99 from the App Store. Next time you travel overseas, think about downloading eCurrency. 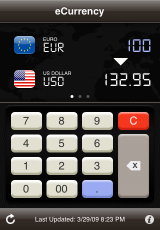 The simple interface supports 34 currencies with rates provided by the European Central Bank. All its functions are on one screen and it has a “shake to inverse calculation” feature. There is also a designated keypad for faster entry and it is compatible with iPod touch and iPhone and with a 2.0 software update. eCurrency is available at the App Store for $1.99. Easy Dials It was conceived by Riverturn as the answer to dialing one-handed. You can flip through full screen images of contacts and merely double tap to dial up a number. Tilt your iPhone’s screen and you can automatically scroll through the list or add an image. Also available is the Easy Dials It Lite that only keeps two of your contacts. Both are available at the App Store for $1.99 and $0.00 respectively. Become a samurai and slice through your opponents, even if you do not own a Wii. The Katana application lets you pull out the sword, then swing your iPhone/touch at the evil-doers until they are defeated. Sound effects though your headphones or speaker include weapon noises and your enemies’ defeat when you put your sword back in its scabbard. Katana is on sale 30% through February 28. You can get a copy at the App Store for $1.99.